As Always, Thankful for You! In the Holiday Spirit, Already? We’re back for another installment in our fashion series on NineteenTeen focusing not on dresses and gowns (gorgeous as they are) but on the little things that complete a fashionable ensemble—hats, shoes, gloves, purses, parasols, and other accessories. Our accessory of the week is the scarf or shawl, a particular favorite of mine (you don’t want to know how many scarves I own!) 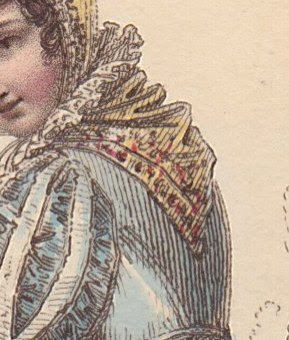 I’m not including fitted wraps or mantles—basically, colder weather wear— in this survey; we’ll look at those at a later date. In this era of no central heating, the shawl was a ubiquitous—and needed—garment. 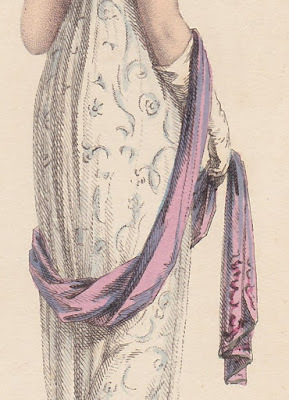 Ladies made a virtue of necessity by turning it into not only a fashion statement, but also a status indicator, via expensive imported shawls from India of silk and cashmere. 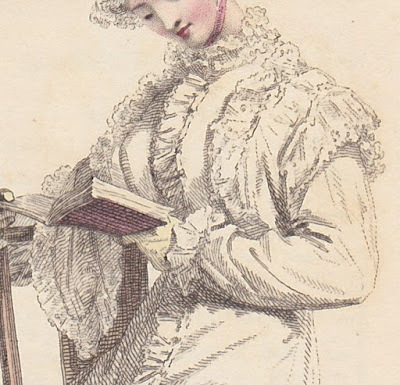 We’ll be seeing examples from 1809 through 1815; I’ll cover later years in the next installment. 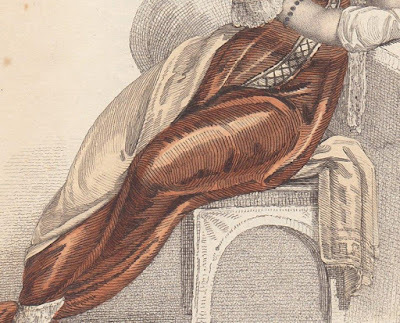 Look for lots of images rather than commentary, though I’ll try to supply original text if I have it—the point is to be able to examine multiple examples of each item. 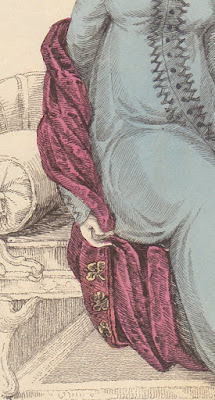 Images are drawn from my collection of prints from Ackermann’s Repository. 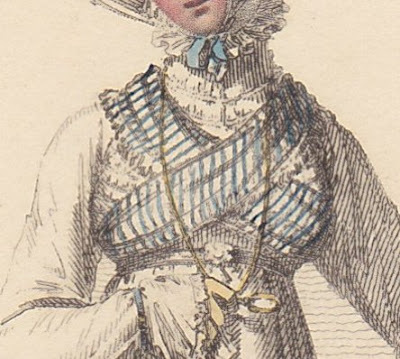 Happy accessorizing! 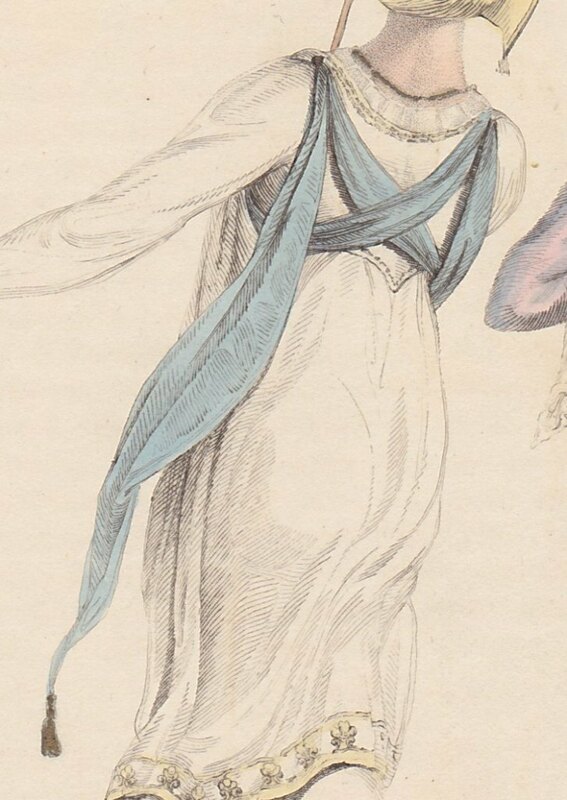 Promenade Dresses, August 1809, Ackermann’s Repository. 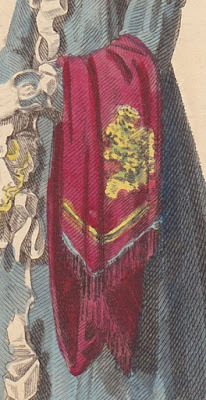 Possibly an imported Indian shawl of wool or silk? 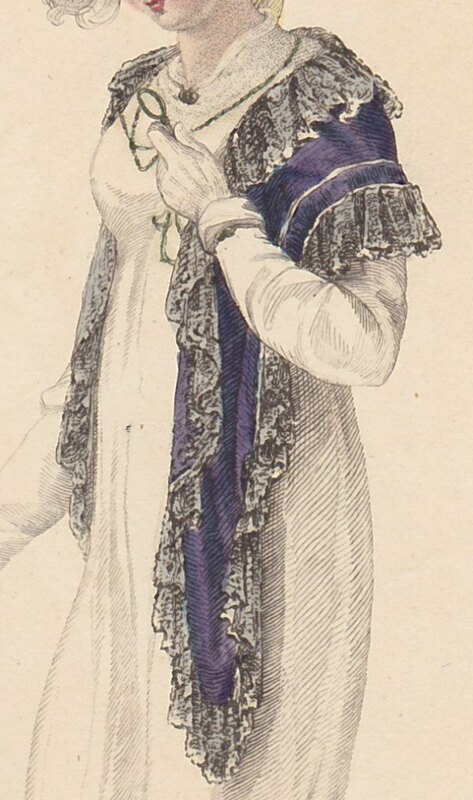 The deep lace edging on this shawl is stunning. Another Indian import shawl, to judge by the rich color and design. 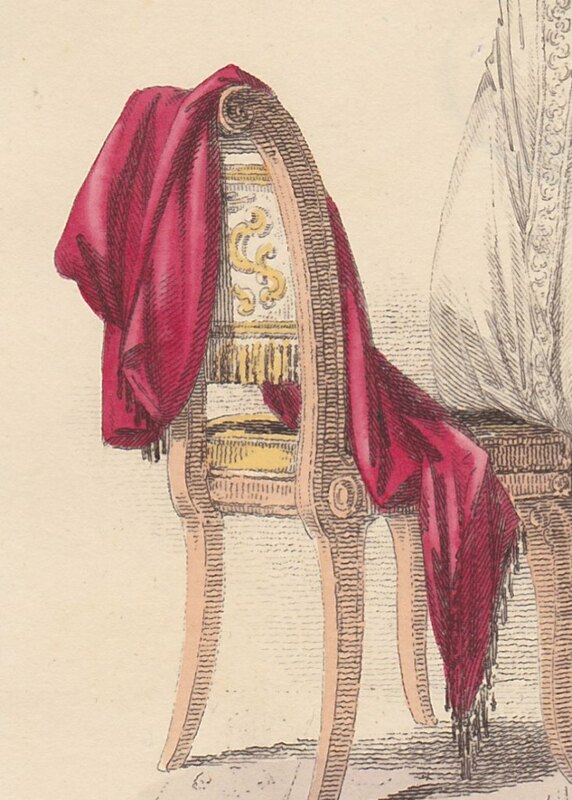 Original text says this is a "Shawl of white Indian mohair or Paris silk, embroidered with gold and shaded brown silk, finished with correspondent tassels..."
The description reads, “French tippet of leopard silk shag.” Ooh, faux fur! 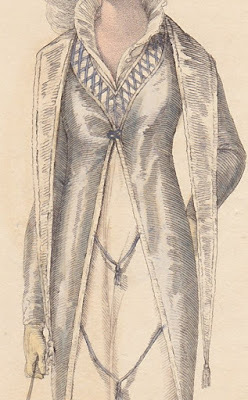 Evening Mourning Dress, December 1810, Ackermann’s Repository. 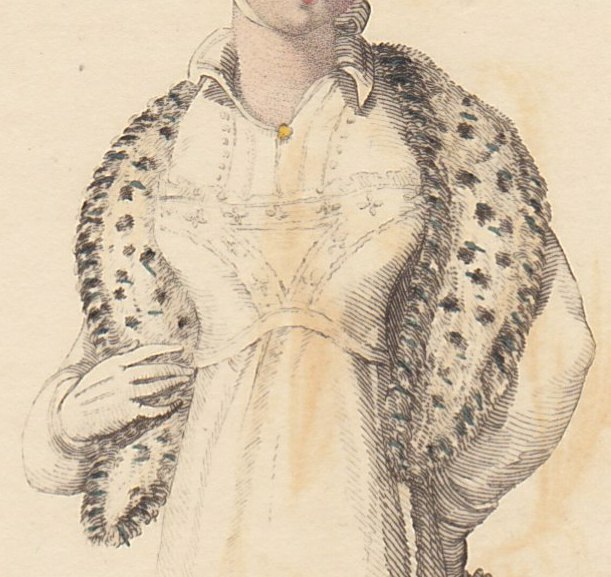 Fur boas like this will be in fashion for the next twenty-five years. 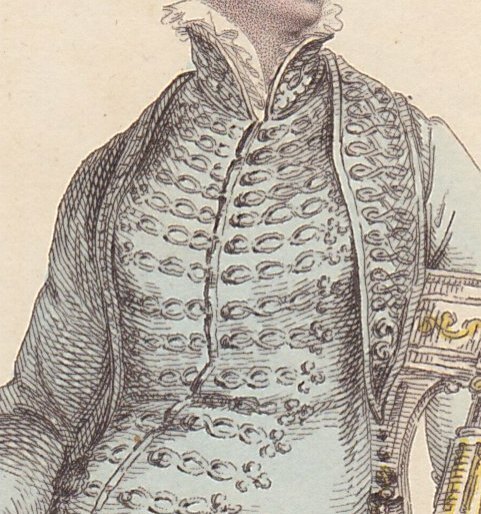 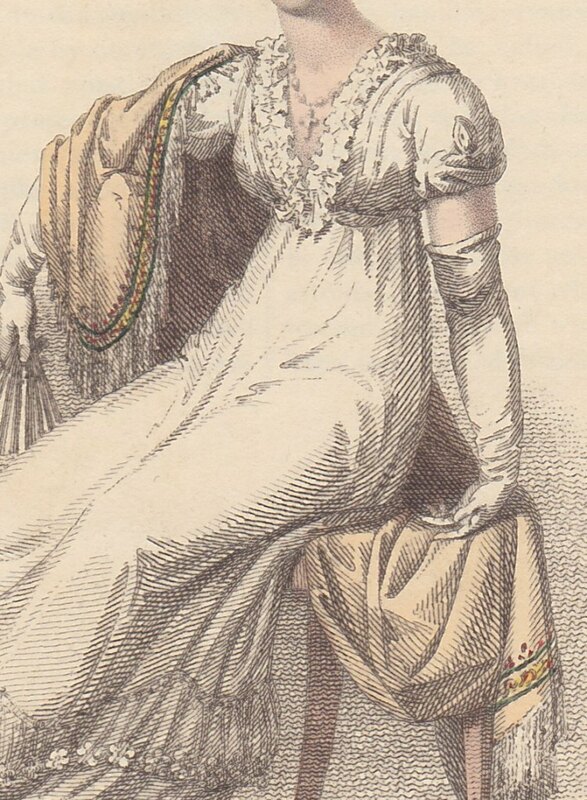 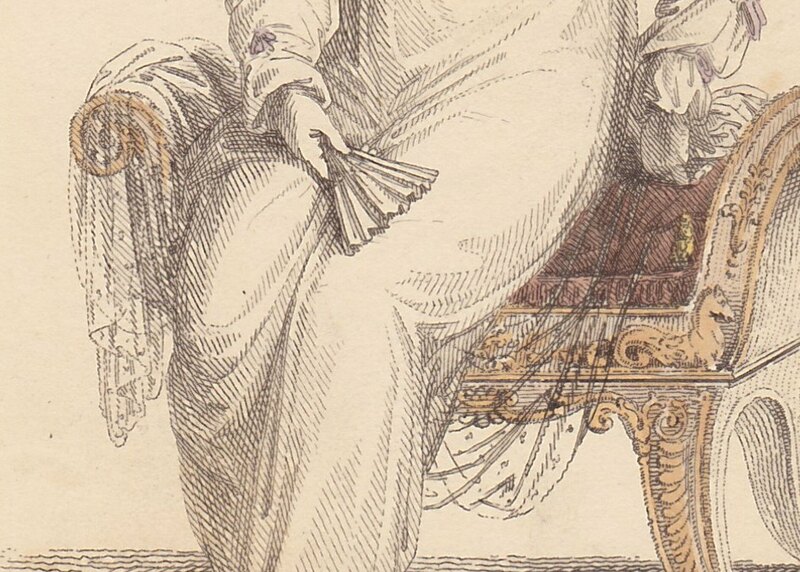 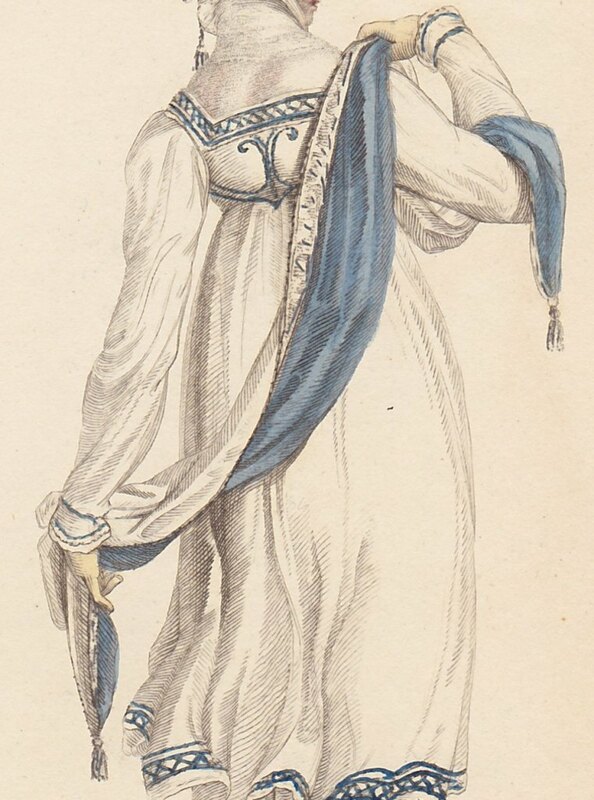 I love the way this tippet is decorated with elaborate braided frogging to match the pelisse. An airy lace scarf will become a commonly-seen accessory in the next several years. 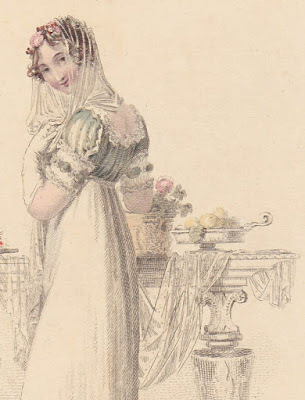 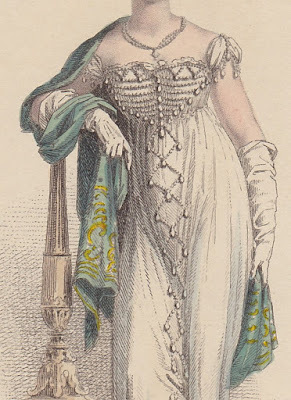 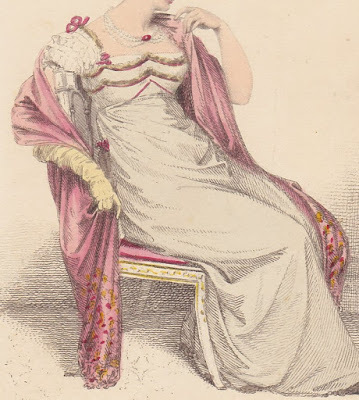 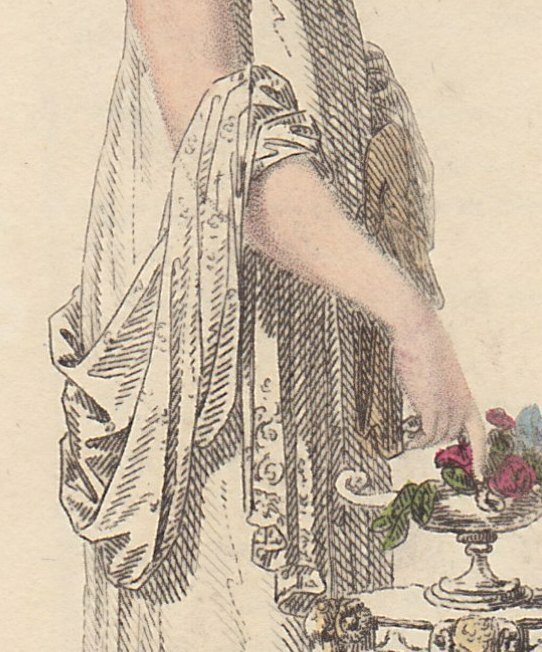 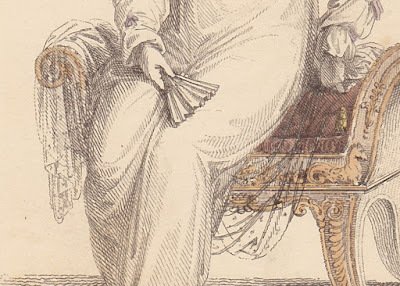 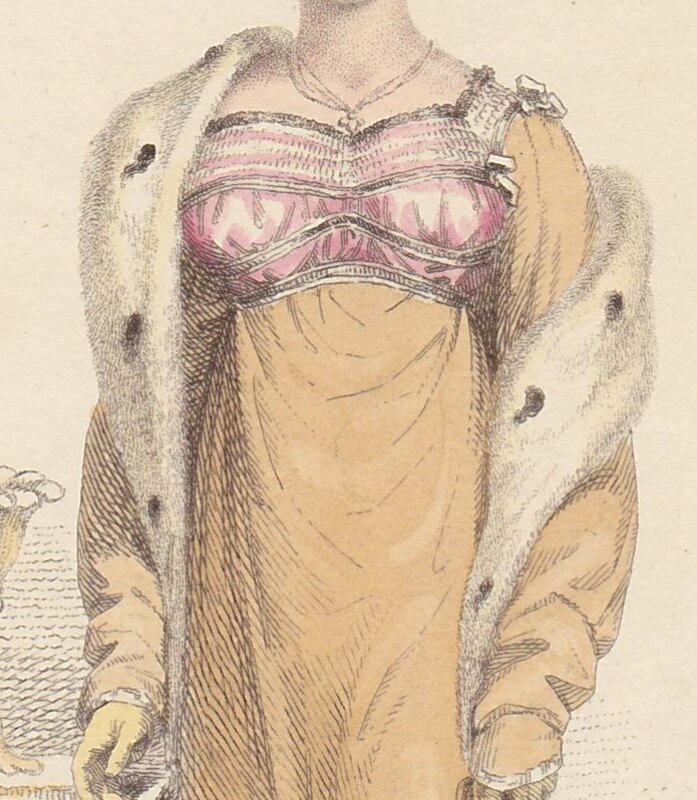 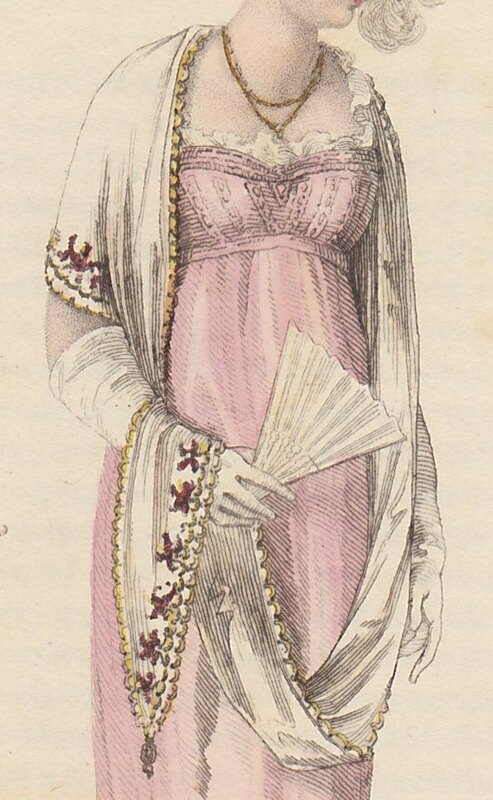 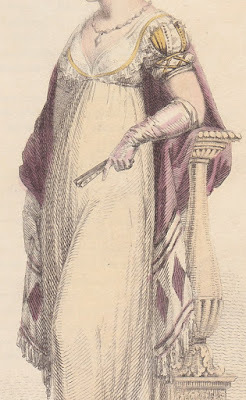 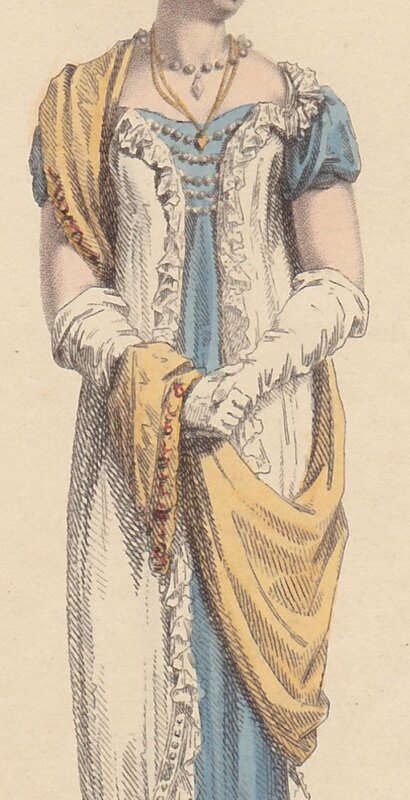 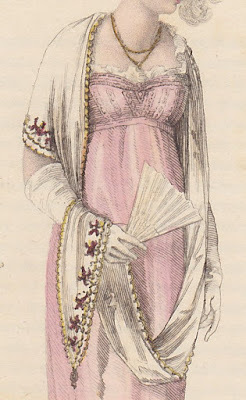 Full Dress, May 1813, Ackermann’s Repository. 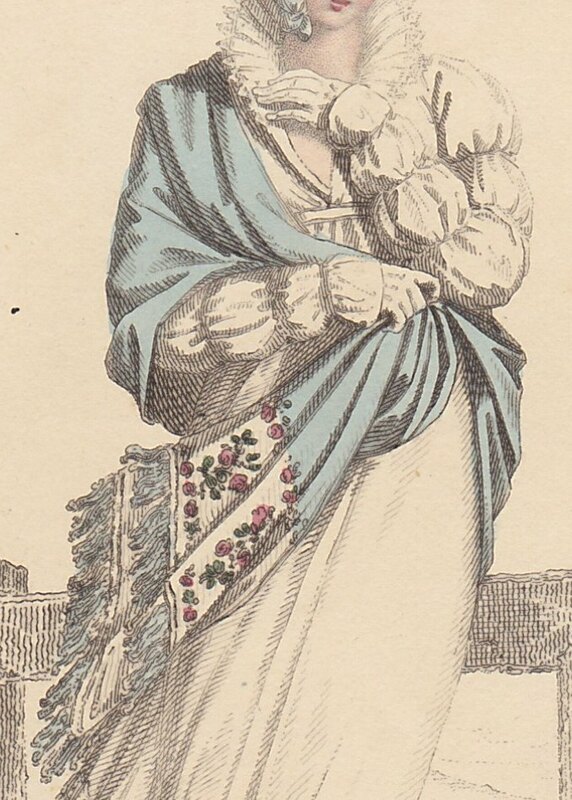 Interesting use of a scarf here, wrapped around the upper body. Another stunning shawl to end with!